The date of the 2014 Shamrock Shuttle has been moved from this weekend (March 1st) to Saturday March 15th from Noon - 6PM. The reason for the change was due to the poor weather foretasted for this weekend. The Mayfair Civic Association has participated in 4 meetings with the bar owners involved in the Shuttle to ensure that the neighbor's concerns were addressed. (primarily urinating in public, and litter). We have also met with Captain McCloskey of the 15th to discuss police presence during the event, and the Captain has also met with the bar owners to discuss the same. As a result of our meetings, the bar owners have agreed to place 70+ porta potties along Frankford ave and surrounding areas during the event, and they have hired the Father Judge football team to clean up the following day. We have also made arrangements with the Philadelphia Parking Authority to prevent parking in front of each bar so the the buses can pull right up to the curb instead of blocking the street. This will make the event safer for attendees, and easier for cars to pass. The bars are also using wristbands during the event to ensure that everyone is properly carded, and they have special event cups to prevent outside alcohol form entering the event. Captain McCloskey has said that he will beef up patrols, and these patrols will include patrols in the alleyways. 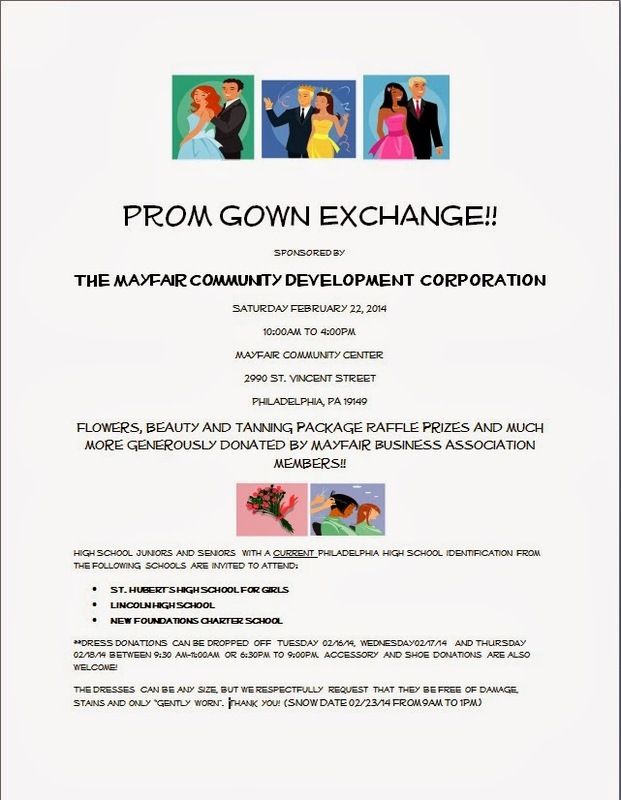 Mayfair Town Watch will also be on hand patrolling as well. While I understand that we can never make everyone completely happy, please keep in mind that this is a 6 hour event, and many of these bars rely heavily on the revenue collected during this event to get them through the summer months while people are vacationing. This is also a huge day for other businesses in Mayfair, such as pizza places like Gino's, restaurants like the Mayfair and Emma's, and others like the Soft Pretzel Factory. 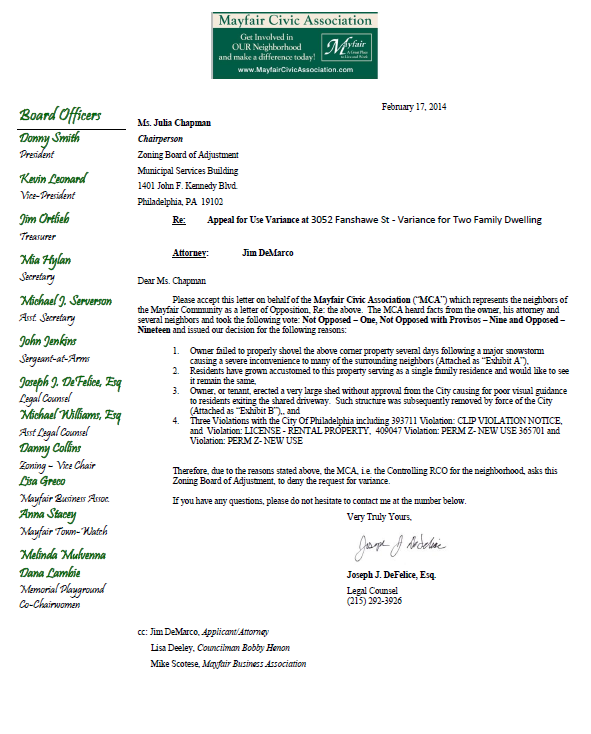 I am happy that the participating bar owners have taken the neighbors concerns seriously, and that they have gone to great lengths and expense to ensure that the 2014 Shamrock Shuttle is fun, and safe for everyone visiting Mayfair! Therefore, due to the reasons stated above, the MCA, i.e. the Controlling RCO for the neighborhood, asks this Zoning Board of Adjustment, to deny the request for variance. Are you tired of the 10 menus that accumulate in your door during a 24 hour time period? Tired of cleaning them up off of your lawn and your neighbors lawn on a windy day? Click the link below and it will direct you to the City of Philadelphia Department of License and Inspections Circular Non-Delivery Decal Order Form.